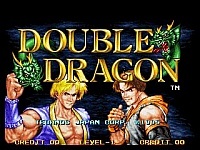 When I heard about the Neo Geo version of Double Dragon, I imagined it to be a side scrolling beat 'em up, but it turned out to be a decent one on one beat 'em up instead. This game is loosely based upon the film (yes, that abomination of film making), which doesn't really inspire confidence, but when I played this game I was pleasantly surprised. There is a selection of 10 characters to choose from, including the two main characters Billy and Jimmy and also a guy called Cheng-Fu that looks a lot like Jackie Chan's character from the classic Drunken Master films (cool!) among others! Each has a decent set of moves and also a second energy bar which charges up when you attack or get hit. Once full you can perform a button combination, which powers you up and make all of your attacks stronger. 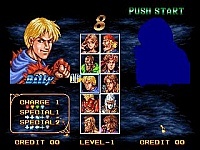 For instance, Billy's Fireball attack reaches across the whole screen when powered up. Control in this game feels quite good, it moves along at a decent pace and it is easy to chain moves together with some practice. Most of the moves and ideas in this game have been stolen from various other games, but most beat 'em ups steal other peoples ideas anyway, so this doesn't really matter too much. Graphically DD isn't too bad either. While not being the best on the Neo Geo, the characters look good although the animation isn't brilliant but serves its purpose. The stages have some nice touches to them though. 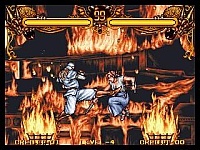 For instance, when you get thrown into the torches on Rebecca's stage, they fall over and fire spreads across the background. One or two of the stages will probably make you feel sick though, such as one where you are fighting on top of a moving plane. The background just looks like a blurry mess gave me a headache. The intro in this game actually has some FMV from the film, which is very grainy, but is the first time I have ever seen anything like it on the Neo Geo. The music in this game is good in places and passable in others. One standout stage is Burnov's which has a nice guitar solo on it. The sound effects could have been better though, because the effect for when you hit your opponent doesn't seem anywhere near convincing or �beefy� enough. Aside from that, the sound is normal beat 'em up fare. Overall, this is a decent game and WAY better than I imagined it would be. One thing is for sure; you would be way better to spend your time playing this than watching the atrocious movie! 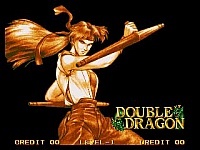 Give Double Dragon a try, keep an open mind, and you might be pleasantly surprised yourself. well i read somewhere that this is second part from side scrolling game and the film was based on the first part and not the game based upon the film am i right?